UPDATED MOTOR ORDER INFO & FLIGHT HAZARDS MAP! If you’re interested in flying rockets or just relaxing outside and watching some cool flights, all are welcome! 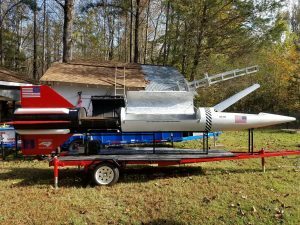 New River Valley Rocketry (NRVR) is prefecture 143 of the Tripoli Rocketry Association (TRA) and we’re looking forward to flying a lot of rockets in the mountains of Virginia this summer! While many clubs have crops and are restricted to low or mid power, NRVR has a beautiful site for moderate high power flights nestled in the cool hills of south western Virginia. Our July launch is shaping up to be one of our biggest yet and we’re excited to fly with as many HP flyers as possible! Launch site, local hotels, camp grounds and amenities are detailed here. Want To Attend? Please RSVP! so that we can get an accurate headcount for parking and food! We have extra flight line parking spots, but advanced reservations are now closed. The remaining 7-8 flight line parking+setup space is now first come first serve. Parking map is on line here. Launches/Recovery, Map, Hazards UPDATE! : Our recovery area is a large, multi-use farm with research grasses and crops, a dairy complex. Prevailing winds usually provide adequate recovery area for flights in the 5000’ – 6000’ AGL range, but we do like to bring them down fast and pop’em low! 🙂 Here’s an interactive google-layers map of our July launch layout including recovery hazards. $15 Launch Fee: NRVR normally charges no launch fees, but this is a big event and we need some help putting it on. Volunteer to help with RSO/LCO or HP pad duties and get $5 back! We take cash or check at the launch. Email officers(at)nrvr.org to reserve a volunteer slot and get your discount! Ken Allen of Performance Hobbies will be on-site all weekend, and we’re also placing hand delivered orders with Kevin Dunn of Wildman VA.
1) Call/TXT (202)723-8257or Email Ken/Performance to get the latest inventory list and be sure to pre-order motors with Ken by noon on Friday 7/14. Here’s his latest 38mm single use shippment (as of 7/9)! 2) Look over WildmanVA and email/order Kevin Dunn (by Mon 7/10, EXPIRED) or check the main (upstream vendor) Wildman’s inventory (by Fri 7/7, EXPIRED) and get orders in ASAP. NRVR will be picking up the Wildman orders and hand delivering them on site at the launch for you (to save us all on shipping). Facilities: On site, running water bathrooms! Food: The “Rocket BBQ Grill” catering is on site all weekend! Proceeds from the “Fundraising Menu” is going to a worthy cause.. to fund his big Nike Ajax HP project! 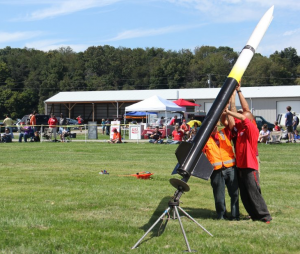 We look forward to putting up some awesome rockets and we hope to see you there!